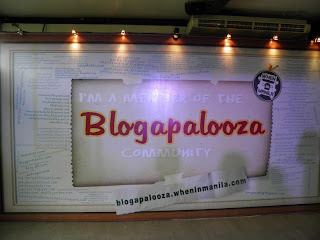 The first ever Blogapalooza was held last September 17 at the Fullybooked - Bonifacio High Street. The aim of this event is to bring mutual benefits to both business and bloggers, hence it was dubbed as B2B. There were over 100 bloggers and 50 businesses who graced this event. Each business representatives were given 5 minutes to talk. Imagine how hard it was to present a company's profile in just 5 minutes, but lo and behold all of them did it gracefully. 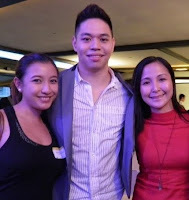 Cool, energetic and super nice Vince Golangco of When in Manila and Mellow 94.7 is the prime mover of Blogapalooza. Printed on the giant tarpaulin backdrop are the blog sites who were invited for this event. 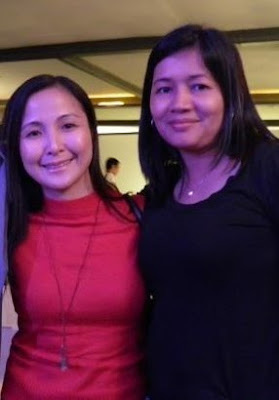 My only date, Nora Aquino of More Than Just A Sahm, won a nice pair of shoes from the raffle. The following are the sponsors, in alphabetical order, of the first ever Blogapalooza. oh my dear, thank you so much for giving a link juice here. 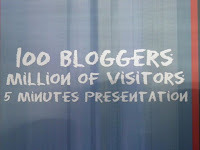 I hope there is Blogapalooza 2 soon and more time to meet other bloggers and businesses at the event! It was a big success! By the way, did you enjoy your SIZE MATTERS burger? We should try Breakfast in Bed Burger and sausage next time. Maybe we should visit SIZE MATTERS Tomas Morato branch sometime. I seriously want a part 2 of this one. That time, I will surely attend no matter what! Nuts: naku, I enjoyed the SIZE MATTERS BURGER, kahit malamig at basa basa pa, lol! Pink Magaline; Til next time...sana andun kami ulit ni nuts!!! Iris: I saw Montch, going down, kala ko sya lang mag-isa. I asked if you're there, di nya ata narinig tanong ko, kasi pababa kami pareho, going out at Fullybooked...sayang! I took the couples photos around 123o...maaga ako dun, asi in 1030am. Kayo what time dumating? ay bakit wala akoo dyaaaaaaaaaaaaaaaan!!! :P heheheheh saya saya!!! I hope I can attend events like this in the future :).